position Rectangle on the screen to use for the slider. label Optional label in front of the slider. leftValue The value at the left end of the slider. rightValue The value at the right end of the slider. int The value that has been set by the user. Makes a slider the user can drag to change an integer value between a min and a max. 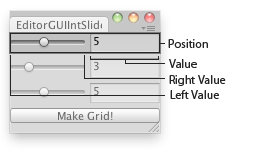 Int Slider in an Editor Window. property The value the slider shows. This determines the position of the draggable thumb. Makes a slider the user can drag to change a value between a min and a max.